We only purchase Match-grade Barrel Blanks from manufacturers who guarantee their product has the best available tolerances. Both Select Match Stainless and Match-grade Chrome-moly barrels can be fitted. Parallel, rifled blanks are purchased and all additional machine work, except fluting, is completed in-house. The standard lengths are up to 26″ for Shilen and Krieger. Longer blanks can be obtained but, except for standard NRA 30cal x 30″ target rifle barrels, will carry a surcharge of £15 per inch. A good selection of barrel twists are available from 1 : 7 to 1 : 18 depending on the bullet weight and style you wish to shoot. There are so many high quality barrel makers that the choice is often personal preference. We carry a stock of the common bore sizes and twist rates from Krieger and Shilen. In addition, we occasionally have Lilja, Bartlein and Hart blanks in some specifications and will be pleased to supply any barrel from these manufacturers. Krieger cut rifled barrels are having good success in the competition world and are proving to shoot well for us. Krieger have installed cryogenic treatment facilities and are treating all blanks before beginning to machine them. They report that the blanks are easier to machine with the result being a straighter hole. Although the advantages may be academic it makes chambering the blank with a concentric chamber simpler if the bore is straight. Accurate rifles require barrels and actions to be squarely aligned to achieve maximum performance. With this principal in mind, the barrel is carefully threaded to ensure a perfect fit. This work is not readily visible but is essential to reach its full accuracy potential. Considerable amounts of capital have been invested in purchasing equipment & tooling which allows us to work to the tightest tolerances and we are constantly upgrading our machinery to keep at the forefront of technology. Our chamber reamers are ground to SAAMI, CIP or Custom dimensions with minimum tolerances and are used only in conjunction with 0.0001″ increment interchangeable pilots. 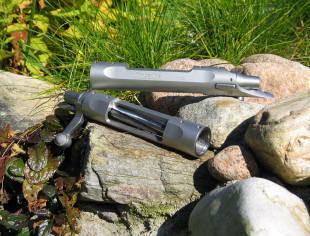 Currently we have over 120 different reamers to choose from; please refer to our current list. We commonly change the calibre/chambering of a sporting rifle during rebarrelling. Providing the bolt face and magazine length are suitable then we are pleased to discuss any appropriate changes. Please bear in mind that the barrel channel in the stock will often have to be increased to suit a larger diameter barrel, this is not included in the cost of re-barrelling. We will be pleased to carry out any servicing work required to action or trigger while the barrel is being replaced but this should be included in a letter of confirmation to be sent with the rifle. A quote can be provided for all work if required. All complete rifles, & re-barrelling jobs, have to be sent to one of the Proof Houses to be test fired; we currently use the London Proof House. We request that all our proof marks are engraved onto the barrel as this leaves a much neater finish. We offer barrel finishes in polished and bead-blasted (matte) for stainless steel and machine polished black or matte black for chrome-molybdenum steel. Chrome-moly barrels can also be hand polished for a traditional high gloss finish. All barrels supplied and fitted by Precision Rifle Services Ltd carry a full guarantee. If the barrel does not perform the way that we consider appropriate and is returned to us within sixty days of supply, it will be exchanged at our discretion. In order to keep the costs of rebarrelling down, testing and load development are not included in the price. If a rifle is returned and is subsequently found to shoot acceptably the costs of load development work will be covered by the customer at our current charge of £150 plus carriage. 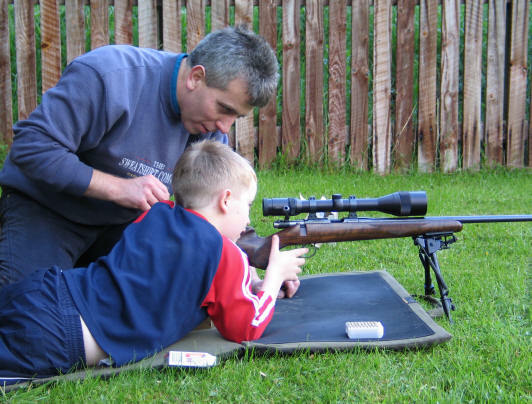 Please bear in mind that the barrel is not the only component which will influence the accuracy of a rifle.